If you wish to relax after a stressful week at work than an afternoon at AAMI Stadium is for you. Take your family to see the local professional football derby between the Adelaide Crows and Port Power on a Saturday evening. Enjoy the noise of the crowd as you hear people yelling and singing their team's song. 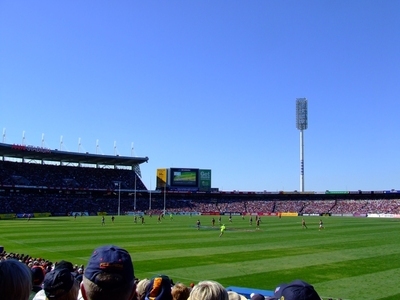 Experience the excitement of watching the Crows or Port Power as they play interstate teams such as the Brisbane Lions or the Sydney Swans at their home ground. If you are happy to watch the local amateur men play rugby or Aussie Rules there are plenty of matches for you to view throughout the year. The stadium is a sight to behold with its short, green, grass and seating with large covers over it. The ground is not large; however, it is neat and it allows people to have the pleasure of watching the game easily. The tickets are not cheap; however, they are great value for money particularly if they are season ones. Public transport is available to take people directly the grounds quickly and easily. You can take a packed lunch with you or you can buy food at the kiosk before the game or during the half time break. If you require further information you can check to see who is playing as well as ticket prices at www.aamistadium.com.au and enjoy your day off work.